As early as in the year 2004 the Committee for Construction and Maintenance found out that the house used as lodge placed on Hunderupvej needed a thorough repairs both out and inside. In other words it meant a very comprehensive renovation. It was not possible to extend the lodge at the property at Hunderupvej unless it would cost a fortune. The Committee for Construction and Maintenance decided that it was better to save the money for renovation and instead used the money for a new building which from early start was designed to be a Lodge. Many projects was designed and discussed before the final very unconventional projects was carried out in the spring 2005. The project was created by a brethren of the Lodge who was architect. Also in the spring 2005 it was decided to sell the house Hunderupvej 49. Because the address in Odense was very attractive we hoped that it would be possible to sell fast and at a reasonable price so it should not be necessary to raise a big loan to financier the new Lodge. The Lodge already had an option on a site to a very reasonable price. Everything happened fast and on the 15 August 2005 the construction of the new Lodge on Munkehatten 20 was started. As the house at Hunderupvej 49 was already sold in the summer 2005 we did not have any place to meet during the autumn semester. All furniture and equipment was store in a warehouse. Only the most important inventory to be used during meetings was kept in some cardboard box attending personal care of the Lodge Master and Officers. We looked around to find a place for our meetings. But it was more difficult than expected to find a proper place. There was no logical places to give us shelter until the new Lodge building was ready. In the beginning we used a restaurant but it was a rather expensive solution. Luckily a contact to “Dansk Broder Orden” was made. This order had a house on the Brockdorffvænget in Odense. They allowed us to use the lodge under very favourable terms. 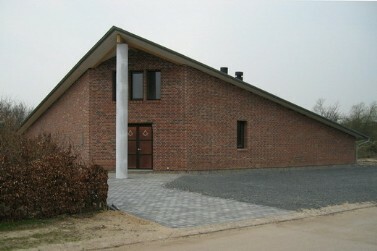 In the beginning of February 2006 the new Lodge was ready for use. The building was far from completed but it was niece once again to be in ones own house.